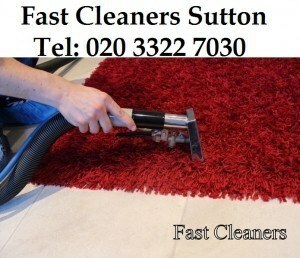 Your carpets should look immaculate and smell fresh. Regular cleaning with quality cleaning products can ensure this and add to the longevity of your carpets. Dirty floors and carpets are one of the first things that people notice in a room, so for a professional finish and clean floors, contact us at Fast Cleaners Sutton. Our specialist skills include stain removal, steam cleaning, hard floor cleaning, and even rug cleaning so whatever your mix of flooring, we have the experience to deliver superb results on your floor surfaces. Your clients will be able to tell that you have had your floors professionally cleaned, and we can offer optional extras including stain protectors, anti-static treatments and pest repellents for which we can offer additional quotes. Members of the National Carpet Cleaners Association (NCCA), all our work is fully guaranteed and all our cleaning staff are fully insured, vetted and are uniformed. For our domestic clients, our cleaning company can offer a carpet cleaning service for your full home including those awkward areas to clean such as flights of stairs or small spaces like bathrooms. We always use professional cleaning products and always try wherever possible to use the greenest products on the market. Our 13 years of experience ensure we have the knowledge and expertise to provide the most professional cleaning services available anywhere in the Greater London area, so call us now on 020 3322 7030 and speak to our friendly team or use our quick quotation form on this website. We offer competitive cleaning prices for all our cleaning services.